A spherule that has been sliced and polished. 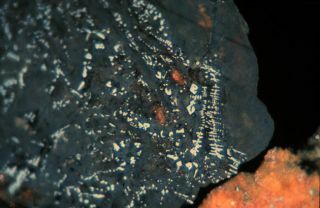 The dark areas are clay minerals and the bright, reflective grains are spinels. The asteroid that struckthe Yucatan Peninsula 65 million years ago presumably initiated the extinctionof the dinosaurs. The huge collision also unleashed a worldwide downpourof tiny BB-sized mineral droplets, called spherules. The hard rain did not peltthe dinosaurs to death. But the planet-coveringresidue left behind may tell us something about the direction of the incomingasteroid, as well as possible extinction scenarios, according to new research.The falling spherules might have heated the atmosphere enough to start a global fire, as one example. How the spherules formed inthe first place, though, has been a bit of a mystery. One theory is that thesehalf-millimeter-wide globules precipitated out of a giant cloud of vaporizedrock that circled the planet after the collision. "That vapor is veryhot and expands outward from the point of impact, cooling and expanding as itgoes," said Lawrence Grossman of the University of Chicago. "As it coolsthe vapor condenses as little droplets and rains out over the wholeEarth." Grossman and Denton Ebel,from the American Museum of Natural History, have shown that this vaporcondensation model is consistent with data taken from spherules around the world. The scientists also foundthat chemical differences in spherules from the Atlantic and Pacific Oceanimply that the vapor plume initially moved east, which might pinpoint thearrival direction of the asteroid. The spherules populate athree-millimeter layer, called the K-T boundary, which separates the Cretaceousfrom the Paleogene (formerly called the Tertiary) geologic periods. The abruptdisappearance of large dinosaur fossils - as well as many marine life fossils -above this boundary implies a major extinction event occurred 65 million years ago. Around this same time, acity-sized asteroid landed near the present-day town of Chicxulub, Mexico,where traces of a 100-mile-wide crater can still be found. There is evidence for theasteroid in the unique mineral content of the KT boundary - specifically a highconcentration of iridium. This heavy element is very rare on the Earth'ssurface but is found in high quantities in meteorites. The implication is that theenergy released in the collision fueled a fireball of vaporized rock that roseabove the clouds. In this way the asteroid's contents - as well as the materialat the crash site - were dispersed across the globe. "The [KT] layer isthought to be the fallout from the fireball," Grossman told Space.comin a telephone interview. Included in this falloutwere glassy spherules, which have been largely transformed due to weathering,but still contain 100s of spinels - tiny mineral deposits with magnesium, ironand nickel. "One reason thespinels are important is that most of the original minerals in the spherulesare all gone - turned into clay," said Frank Kyte from UCLA, who was notinvolved in this work. "The spinels appear to not have been altered." Because of their pristinestate, scientists have studied the spinels in hopes of learning about thecataclysm that created them. One such study concluded that - because thespinels contain metal oxides - they could not have precipitated out of thevapor plume up above the atmosphere. "The argument issilly," Grossman said. He knows this because theconclusion drew on his own work describing how spinels are created inmeteorites. These spinels formed long ago in the pre-planet gas that surroundedthe Sun. This gas was mostly hydrogen, so it makes sense that very littleoxides - metals bonded with oxygen atoms - are found in meteorites. But the vapor plume was adifferent story. "When you vaporizerock, there is very little hydrogen - whereas 50 percent of the atoms in a rockare oxygen," Grossman said. As described in theupcoming April issue of the journal Geology, Grossman and Ebel performedcomputer simulations that showed that the spinels in the KT boundary - withtheir high concentration of oxides - are consistent with formation inside aliquid droplet condensing out of the impact plume. These droplets solidifiedinto the spherules, which - according to Kyte - all fell to the ground in amatter of hours or days. A more detailed analysis ofthe spherules shows that some of them formed earlier than others. "The spinels that arefound at the Cretaceous-Paleogene boundary in the Atlantic formed at a hotter,earlier stage than the ones in the Pacific," Ebel said. This implies that the cloudof vaporized rock moved east following the collision - a fact that may providehints as to how the asteroid hit the Earth. This is important because differentsorts of debris get thrown into the sky, depending on whether the asteroid camein at an angle or straight down. A complete picture of theimpact's geometry and its immediate consequences should help answer questionsconcerning the eventual effects on the planet's living creatures. This article is part ofSPACE.com's weekly Mystery Monday series.